I wanted to add a few graphic tees to my Summer Collection this year, but I’m on a really tight budget. (Who knew heart surgery was so expensive? ) I’m also super cheap to begin with, so I’m always on the look out to save a few pennies. Once I decided that I’d be making some of my graphics into screen prints, it was pretty much a no-brainer to make my own screen printing frames. Don’t get me wrong, I’m sure buying them is totally worth it! 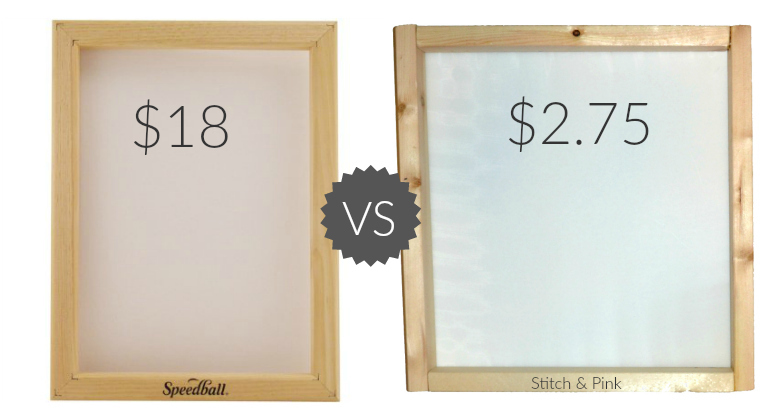 I think Speedball is a great brand and all, but when you need 6-8 silk screens at almost $20 a pop. . .yeah, not gonna happen. My screen isn’t perfect, but that price still looks soooooo much better right? And luckily being the DIY-er I am, we already owned the power-tools I needed to quickly whip up a whole batch of frames. If you’ve got a saw , a drill, and a staple-gun, I highly suggest making your own. It’s super easy, and surprising quick too! 1. Cut your furring strips to the appropriate lengths. I made 11×13 and 9×11 sizes. 2. Arrange your pieces into rectangles and drill holes at the corners, through both pieces. 3. Add a bit of wood glue to the inside ends to help form a tight bond. 4. Screw the corners together tightly and allow the glue to dry. It took us maybe an hour to make 8 new screen printing frames! Now that you’ve got your frames ready, stop back tomorrow to learn how to stretch the silk screen fabric. Toni, you never cease to amaze me. I am loving what you are doing lately!!! this is awesome. You’re so sweet Jess! It’s definitely taken me a loooong time to find my spot in the blogging world, so I’m thrilled to finally know my direction.